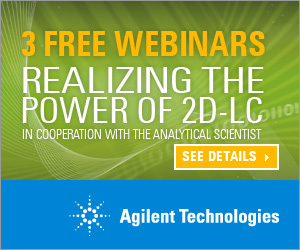 Agilent Technologies and “The Analytical Scientist” magazine present an innovative series of video webinars with live Q&A to make two-dimensional chromatography a reality in labs across the various industry segments. The first webinar is on Wednesday, July 8th, entitled: General 2D-LC introduction with system overview and real-life Heart-Cutting 2D-LC analysis on a running system. Click the banner on the right for additional dates and registration.